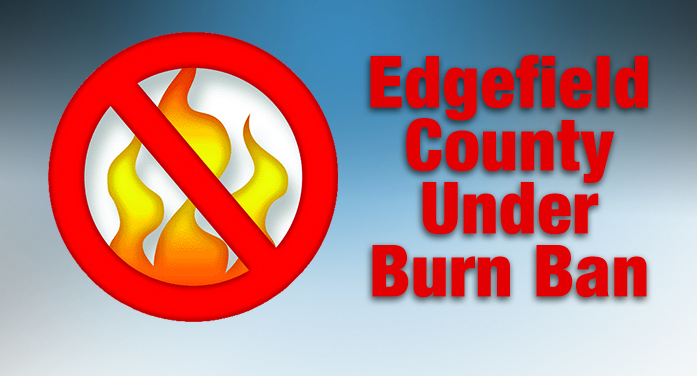 The National Weather Service issued a notice Nov. 11, 2016, that the South Carolina Forestry Commission has issued a burning ban for several counties in South Carolina including Edgefield County. This ban prohibits outdoor burning including yard debris but does not extend to campfires and open-fire cooking. According to the release, the ban is a result of the lack of rain which has produced dry fuel, low relative humidity, and increased winds. “These factors all result in an increased risk for wildfire ignition,” the release stated. Counties not under the ban are still cautioned to be “extremely vigilant” in regards to burning. Merriwether Fire Chief Joey Smith, who spoke with the Advertiser, Saturday, Nov. 12, said that the Merriwether Fire Department had already enacted a red flag alert for their fire district prior to learning of the burn ban. He said the red flag alert was enacted due to the “8-10 brush fires” the department had already responded to over the past week. There was no word on how long the burn ban will last, although it is not expected to be lifted until conditions change. In fact, if anything, the ban could expand to encompass more counties in the state. Citizens wishing to do outdoor burning are encouraged to contact their local fire departments to make sure no further bans or warnings have be activated.